Build instructions for a 2 Meter HALO antenna for omnidirectional ssb and digital modes horizontally polarized. Another set of 2 Meter HALO build instructions. Formulas for calculation of element length is wavelength divided by two (half wavelength) at about 98% efficiency of light speed. The speed of light is approximately 186000 miles per second in free space. 6.8 feet X 12 inches = 81.6 inches). 81.6 inches is how long one wave length is at 144.250MHz. propagation velocity through the element is maybe 98% the speed of light. 81.6" X .98 = 79.97"
80"/ 2 to arrive at 40" length of the element. With the addition of a phasing harness it is possible to stack HALOs for greater gain. This photo is a prototype of an adjustable HALO for multiple bands. I am hoping that this can be resonant and 1:1 SWR in the calling frequencies for most digital modes. I plan to carry this plus a small SDR and maybe transverters in my carry-on bag with clothes for 7 days. It must perform well for weak signals on the 2M, 1.25M and 70cm bands. 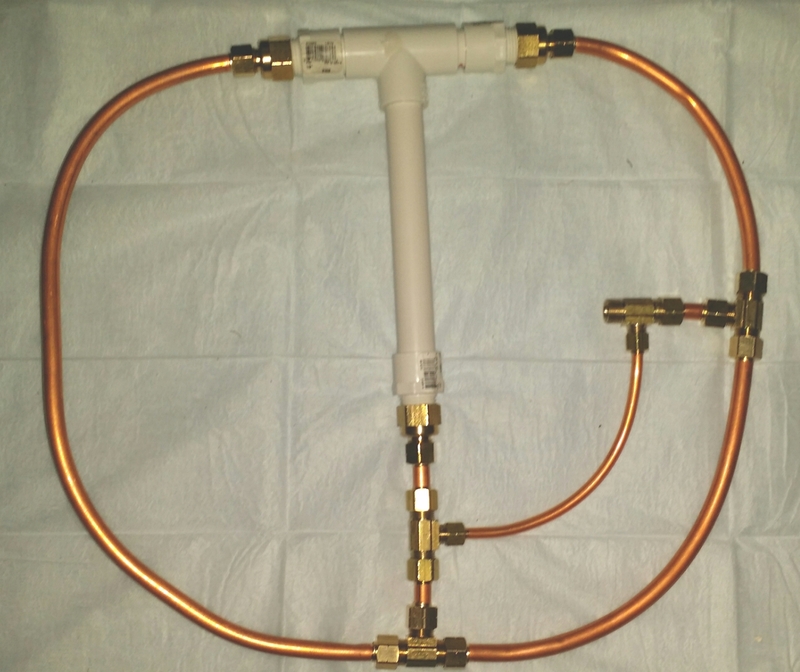 I think that 6M and HF bands could also be possible with sections of copper pipe less than 19" and/or loading coils. It will be interesting to see how tunable it can be by screwing in more or less sections and components.